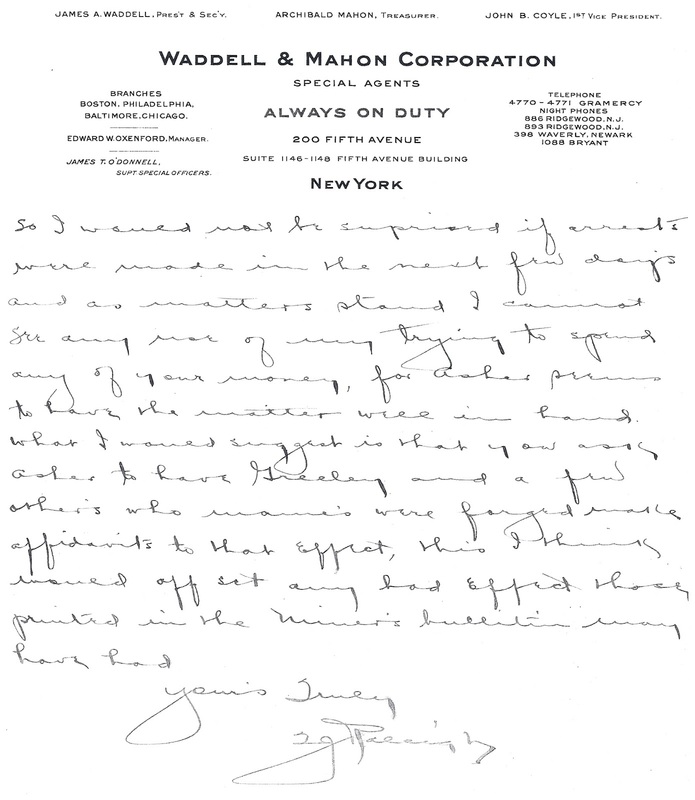 This handwritten letter on Waddell-Mahon detective agency letterhead shows Raleigh's signature and that he was working as a labor spy for the company in 1914. This memo-style letter from "D. L. Robinson" of the Rees, Robinson, and Petermann legal offices to O.F. Bailey, an official with C&H, shows that both the law firm and C&H knew the whereabouts of Thomas Raleigh and were employing him to spy against the WFM in New York City. For almost 100 years now people have wondered what happened to Thomas Raleigh, the man who was charged with murder in the deaths of Alois Tijan and Steven Putrich in the infamous Seeberville shootings. It was thought that he had fled the country, and even Houghton's Special Prosecuting Attorney brought in to expedite cases during the strike opined that he was unable to be found. Where did Tom Raleigh go? Well we've "found" him almost 100 years later in the historic record, and what we have uncovered is damning evidence against the Calumet & Hecla (C&H) mining company officials, the legal firm of Rees, Robinson, and Petermann, and the Waddell-Mahon detective agency. 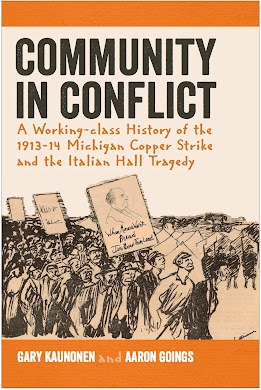 It seems that Thomas Raleigh was working for C&H through Waddell-Mahon to spy on the WFM mineworkers union in New York City. Correspondence between C&H agent O.F. 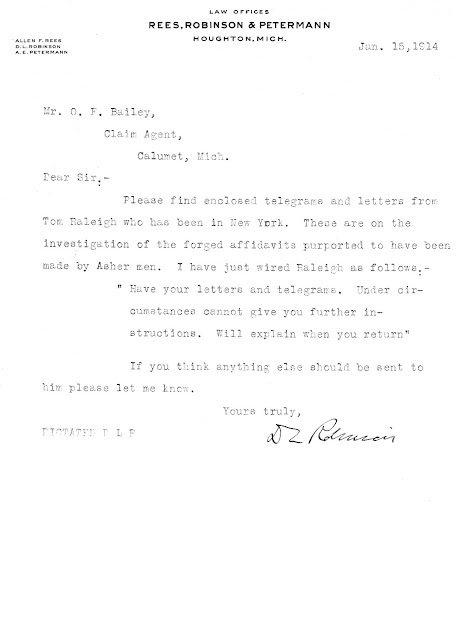 Bailey and a lawyer from Rees, Robinson, and Petermann--a firm representing C&H throughout the strike--gives documentary proof that C&H knew of Raleigh's whereabouts and even employed him in subterfuge during the strike while he was wanted for murder in the Copper Country. 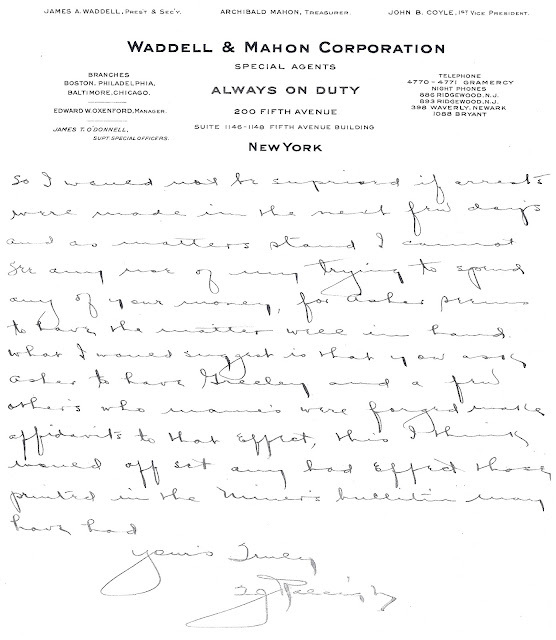 Handwritten letters from Raleigh on Waddell-Mahon stationary also prove that this so-called detective agency, employed by Houghton County Sheriff James Cruse to keep peace in the Copper Country, also knew the whereabouts and shielded Raleigh from being brought to justice in the Copper Country. It seems that Raleigh had learned little in his brush with a murder charge in the Copper Country because while in New York he reported back to C&H and his handlers at Waddell-Mahon that he had busted into the offices of another rival detective agency and wanted to fight the men inside, but that the "four Jew detectives there would not fight." Always classy, Raleigh's correspondence with C&H gives a good picture of a bad man, and also highlights the lengths and lowly depths C&H, their legal representatives Rees, Robinson, and Petermann, and Waddell-Mahon went to hid a murderer from justice.